A native of West Plains, Missouri, Jack Randle Gannon grew up "in the heart of the Ozark Mountains . . . I have always been very proud of my 'hillbilly' heritage." During World War II, his parents moved to Richmond, California and worked in the shipyards. Deafened at age 8 by spinal meningitis, Jack enrolled at California School for the Deaf, Berkeley. After the war ended, the family returned to Missouri, and Jack continued his education at Missouri School for the Deaf in Fulton. "My years at MSD were very rewarding," he recalls, noting that he had some superb teacher-mentors, such as Grover C. Farquhar and G. Dewey Coats, who encouraged him to "develop my interest in writing, to gain basic leadership skills, to discover a sense of belonging." He graduated in 1954, enrolled at Gallaudet College, and further developed his skills under the tutelage of Edward L. Scouten, Alan B. Crammatte, and Robert F. Panara. Actively involved in campus media, he edited The Buff and Blue and the 1959 Tower Clock. Although he majored in Education, his dream was to run his own weekly newspaper, an ambition that "got a little sidetracked after I became a teacher!" He did graduate work at Omaha University and Ball State. During his first year at Gallaudet, he met Rosalyn Lee of Winston-Salem, North Carolina. They married shortly after graduating in 1959, and have been together since, collaborating on numerous projects. They have a son, Jeff, and a daughter, Christy. From 1959 to 1968, Jack taught graphic arts and coached football and basketball at Nebraska School for the Deaf. Under his leadership, the 1967 football squad had an undefeated season, the first in the school's history. In 1968, the Gannons returned to Gallaudet, where Jack became the first full-time Executive Secretary of the Gallaudet College Alumni Association; he set up the first Alumni Office there. He also became Director of Alumni Relations, a separate post. As his responsibilities increased, this job title changed. In 1989, he succeeded Merv Garretson as Special Assistant to the President for Advocacy, working closely with Dr. I. King Jordan. He held this post until 1996. Actively involved with the NAD and WFD, he was one of the founders of the Deaf History International organization, and curated the touring Smithsonian exhibit Through Deaf Eyes (2001-2006). He is, of course, best known as a writer and historian. 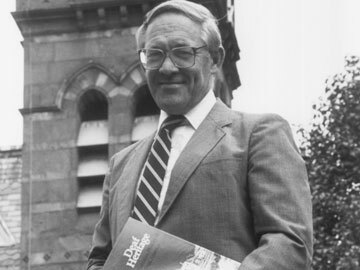 He edited The Gallaudet Almanac (1974). His monumental, acclaimed work, Deaf Heritage: A Narrative History of Deaf America, was published by the NAD and Gallaudet University in 1981. Rosalyn handled the photos (the rich array of photos and illustrations telling their own stories), and Merv Garretson provided valuable feedback. Deaf Heritage was a pioneering work in several ways. Although many changes have occurred since its publication, it's justly considered a classic and cornerstone of a Deaf History library. The Week the World Heard Gallaudet an attractive photo-chronicle of the DPN movement, was published in 1989. Through Deaf Eyes: a Photographic History of an American Community, co-authored by Jack with Douglas C. Baynton and Jean Lindquist Bergey, was published in 2007. World Federation of the Deaf: a History was published in 2011. And on June 30, 2012, Gallaudet University Press reissued Deaf Heritage, with a new introduction. Jack and Rosalyn Gannon, who live on the "Tempted to Be Content" Farm just outside Frederick, Maryland, are still busy, still active, and they know just about everyone in the Deaf Community, too.